Jack Bailey’s Buyer Consultant Training starts today, so I thought I’d share some of what that excellent program will cure: a few of my Pet Peeves! Real estate professionals who don’t know how to use their calculators and can’t figure (or at least look up) a mortgage payment on the fly. Real estate professionals who don’t know how to measure for and calculate square footage (at least good enough to tell if the tax records are wrong). Real estate professionals who can fill in the blanks of their State approved purchase agreement but can’t walk through it with a buyer or seller explaining each boilerplate paragraph. Real estate professionals who can’t do basic pre-qualification of a buyer including an initial discussion of finance including an examination of income-to-debt ratios. (Though important, this is not a substitute for an in-depth discussion with a lender). Real estate professionals who can’t accurately (within a reasonable tolerance) calculate seller net proceeds and buyers’ funds needed to close quickly and on a legal pad if necessary. Real estate professionals who are afraid of the Internet . . . or even uncomfortable with it. Real estate professionals who ‘wing’ their listing presentations. It’s a job interview, for goodness sake! You at least need an outline of where you want to go with it! Real estate professionals who don’t spend money on marketing. Agents should be spending a minimum of 10% -15% of their anticipated 1099 on marketing. Brokers should be spending more. Real estate professionals who expect the MLS to sell all of their listings. Real estate professionals who organize their companies to appeal to agents rather than to serve consumers. Real estate professionals who celebrate mediocre production. Real estate professionals who don’t constantly question why things are the way they are and how they could be better for the buying and selling public. These are just some of mine . . . what are yours? Eight Things You Can Do To Get A Listing TODAY! Here is a post from 2012. The market was a little different back then. We still had a lot of upside down homeowners, lots of Short Sales and quite a few REOs. Still, there’s good stuff here. Challenge yourself! See if you can’t get one by nightfall! Can you get a listing today? I’m waiting . . . can you? Let me rephrase the question: If you were to be hung by the neck until dead at sunset if you didn’t get a listing today, could you get one? I thought so. Getting a Listing is something you can DO in real estate. You can’t force a sale, you can’t force a closing . . . but you can DO a listing. You can get one. It is always within your power. 1. Call all of your past clients. It’s a simple dialogue: you need their help. Inventory is drying up, buyers are frantic to find something. Have they heard of anybody thinking of selling? I would be surprised if you didn’t uncover at least 1 listing lead for every 20 calls. I love that graphic. Unfortunately, the improving market of the past four years has made it a bit irrelevant. Today, if you want to heat up a fence sitting seller, work on where they want to go. Spend an hour or two showing them houses, get them excited about moving. And if they’re moving out of state, start that referral relationship early and have the other agent help get them motivated. 3. Pull all the expired listings for the LAST 12 MONTHS – that’s right, a full year’s worth – and drop them a note about the improving market, the scarcity of listings and the fact that you can save them money! 4. 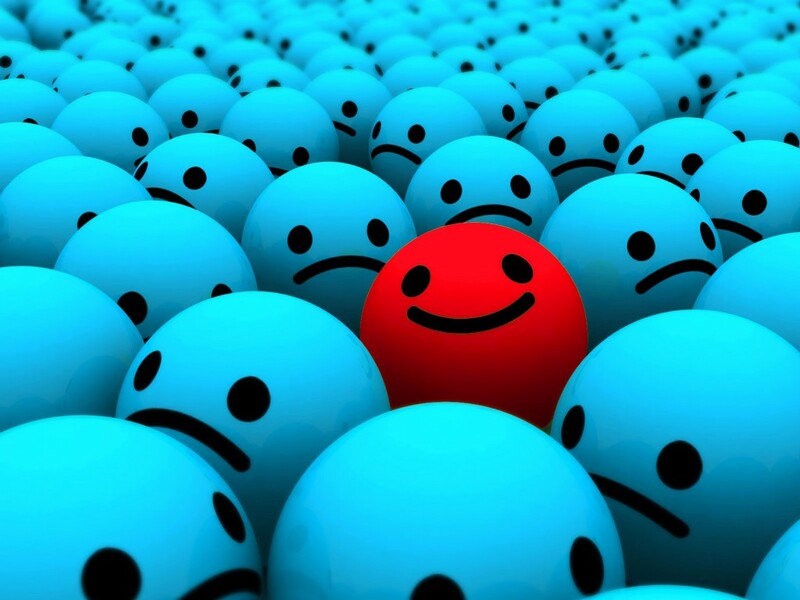 Choose one of your buyer clients who is hot to trot but having trouble finding a suitable home. Working with them, isolate the one or two perfect neighborhoods for them. Then make a flyer with their photo and some humanizing detail, saying they’re looking for a home in that neighborhood. If you’d like to sell, contact Help-U-Sell. And put your ETM on the back. Deliver it however you’d like: snail mail, Excel’s mailbox stuffer program, slide it under the doormat . . . although if you’re trying to beat the hangman at sunset, you’d better stick to doormats. 5. Follow Kurt Steffien’s lead: start cultivating probate attorneys. They are certainly interested in being heroes to their estate clients, and will see your money saving (estate preserving) offer as a way to accomplish that. In other words: they get it. And if you get one and do a good job, it’s not just one listing, it could be many. For months and years to come. Really. 6. Work with Tony (today that’d be Alejandro, Mike or Soren) to build a landing page on your website to capture contact info on people wanting to know what their house is worth. 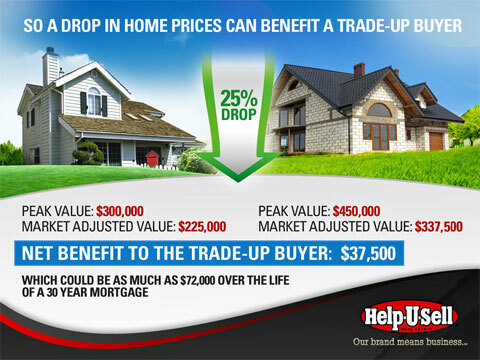 (By the way: this home value landing page already exists on your website! AND, it generates a report instantly so that the people who request it don’t have to wait for a response) Then create a QR Code for it. Have flyers made with nothing more than the QR Code and the words: ‘See How Much Your Home Is Worth Today.’ Put them all over the place. 8. Call Jack Bailey and ask him what you should do. This is July 5. (It’s actually August 9, but the principal still holds true) The longest day of the year was, what? A week and a half ago? So you’ve got a few extra hours of daylight to get it done. Go on now: get out there and don’t come home until you have a signed listing agreement in your sweaty little hand. *about that graphic: For the arithmetically impaired: If you subtract the current value from the peak value of the first home you get $75,000. That’s the amount of the drop in value, what the homeowner ‘lost’. If you do the same for the second home you get $112,500. That drop is $37,500 more than the drop on the first home. Everything else being equal, that’s $37,500 less the buyer is going to have to mortgage. Translation: quit moping about what you ‘lost!’ Get out there and buy your dream home before it becomes unaffordable again. Author James DingmanPosted on August 9, 2016 Categories Attitude, Help-U-Sell, ListingsTags how to list, Jack Bailey, Listing Real Estate, motivating home sellersLeave a comment on Eight Things You Can Do To Get A Listing TODAY! Cool Stuff From Success Summit! Mr. Westman attended! Head of our parent company, Infinium, Ron Westman tends to stay in the background usually letting his team navigate the important Help-U-Sell meetings that occur from time to time. Not so this Success Summit! He was present and involved for every minute of meetings and social functions as well. It was a wonderful opportunity to interact with the man that got us through the worst real estate market in history. Thank you, Ron Westman! A new CI followup program was unveiled. Working with Mike Paholke and Excel Print/Mail, Jack Bailey, John Powell and the home office team developed a series of 8 customizable postcard mailers for staying in touch with past clients and other Centers of Influence. The program is remarkably inexpensive and provides automatic followup to our most important friends. Watch your email and attend the weekly Power Hour meetings for details. A partnership with Movement Mortgage was presented. This rapidly growing mortgage banker comes with an interesting proposition. Instead of waiting to process a loan application until the closing date is imminent, they process everything immediately, completing the package in 7 – 10 days regardless of closing date. This enables buyers and sellers to close early if they choose but more importantly, exposes problems EARLY so that there is no last minute panic. In addition, Movement Mortgage has agreed to undrewrite 25% of the cost of the new CI program mentioned above! Now it is an even better bargain! Robbie Stevens showcased our new corporate website, slated to go live around the first of the year. It knocked my socks off! Really: clean and sleek, very forward looking and modern, it makes our competitors’ sites look ancient. And the functionality – rich in video and short on verbiage – is superb. There is a great new home search function that includes a drawing component where any customized geography can be searched. OMS Lite was presented. This is a new app available at the Apple Store for Iphone and pad that enables Help-U-Sell brokers to add a new listing on the fly. It includes the ability to upload photos and even phone-shot video directly into OMS. An Android version is running through the approval process and should be available soon. Platinum Edge got a dusting off and an update. This tool for use with luxury properties has a new look: stunning black and silver. Guidance on how to use this tool when working with the top of the market will be a feature of future Power Hour meetings. Ron McCoy presented a revamped awards program that recognized top listing offices, top buyer side offices and top closed side offices as well as a new Don Taylor Award of excellence. Congratulations to Jack and Cheryl Bailey and Help-U-Sell Greensboro for being tops in Buyer Sides with 59, and to Richard Cricchio and Help-U-Sell Honolulu Properties for being tops in New Listings with 151. Honolulu Properties was also #1 in total Closed Sides with 167. The special Don Taylor Award went to Brenda Fischer at Help-U-Sell Options Unlimited in Terre Haute, Indiana. In a smaller market with a lower average sale price Brenda, through some aggressive and very creative marketing has captured a BIG share of the market and shown us all there is more to parades than marching! Maurine Grisso, back from almost two years of illness, delighted the group with her newly published book ‘Before You Sell Your Home.’ Available on Amazon.com and Kindle, it will be on SPECIAL for one day, October 22, for the ridiculous price of $.99. Mark your calender, buy the book and then give Maurine a favorable review on Amazon. If there was a theme about this meeting is was that marketing – particularly core marketing to your geographical target market – is supremely important today and that no group deserves more attention than our CIs. Systems to get those two things done automatically (and others) are key to growth. Having missed last year’s Summit, I have to tell you I spent many months hungry for the kind of interaction that only comes when Help-U-Sell brokers from across the country come together to share and learn. I am delighted that I could attend and if I ever miss another – I’ll probably be dead! Author James DingmanPosted on October 17, 2014 October 17, 2014 Categories Attitude, Help-U-SellTags Brenda Fischer, Excel Print/Mail, Help-U-Sell Success Summit 2014, Jack Bailey, John Powell, Mike Paholke, Movement Mortgage, Richard Cricchio, Robbie Stevens, Ron McCoyLeave a comment on Cool Stuff From Success Summit! Ahhhh. That’s what I feel every year at this time. 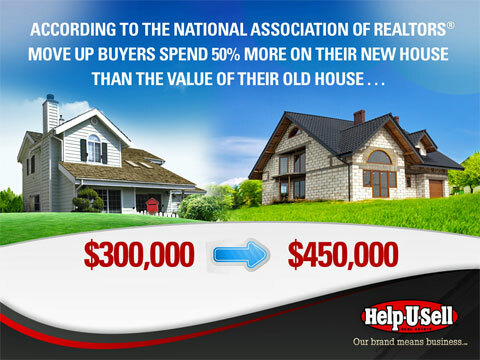 The NAR Expo is history and the Help-U-Sell Success Summit is done for another year. I had lots of anxiety going into this year’s Summit. Last year’s event was so good I thought it would be hard to top. Also, our numbers were down slightly because of the location. Not that Orlando isn’t a great place for a meeting, it’s just that the largest concentration of Help-U-Sell brokers is in the West and they pretty much stayed home. One of our newest members, Kurt Steffein, made the haul from California (and what a wonderful energy he brought along), and Lona Murphy from Oregon surprised everyone by showing up unannounced! A special thank you goes out to both of them. But as we set the room for the meeting, we kept adding chairs and adding chairs, and by the time Jack Bailey rolled in with his entire Coaching Group in tow, we were about 30 people. I could go on and on about who came and the nuggets they shared, but here’s something that’s more important: It was once again, a great meeting. There is excitement about the business and the the opportunities bursting forth over the next several years. Our crew is hungry and ready – their enthusiasm and love for what they do hasn’t paled in the downturn of the last few years. Everybody who attended stayed fully engaged for the entire meeting. We had no dropouts and no nod-offs. Conversation was lively and productive. And there was something else about this group that came through loud and clear – they all genuinely like and care for each other. We talk about a Help-U-Sell Family a lot, and I know, that language is typical of a lot of real estate organizations. But here it means something. It really does. This year – and next year – are OUR years. For the first time in a long time, sellers with equity are returning to the market. That’s our target. Always has been. We have a huge competitive advantage in a marketplace where Joe and Sally Homeowner want to sell, because Joe and Sally also want to save – and that’s what we’re all about: selling and saving. After slogging through a market where many if not most of our sellers were . . . banks . . . who really couldn’t care less about what makes us unique, special and better, we are once again going to be in the driver’s seat. That’s great, but it also means we have to return to an old habit that we’ve gotten away from in recent years: marketing. We have to dust off our logos (so to speak) and go back to spreading the word that we are here, people use us, it works and they save money. The way we spread that word has changed somewhat. It’s much more electronic and frankly, less costly. But make no mistake about it: as right as the timing is, it will mean nothing if we don’t re-invest in marketing who we are and what we do. We are real estate people (thank goodness!) and as such are people people. The highest and best use of our time is usually to be face to face with consumers. However, there is an electronic universe in which the people we need to be talking to are living, at least part-time. We have to be comfortable with that electronic landscape, with how it works and how to position ourselves within it. I know, for most of us, that means hiring someone to manage our online presence; but even then, we have to have a basic understanding of how the Internet works from a marketing standpoint and how to take advantage of the huge opportunities there. We are exceptionally blessed to have Robbie Stevens, Tony Tramontano, and everyone else at Help-U-Sell dedicated to securing our position in this new world and patiently nurturing our collective understanding. I saw so many lights going on in that room the last couple of days as Robbie worked through some of the basics of our own Office Management System. I think we’re all going home more comfortable and a little wiser. I also remain in awe of Ron McCoy. Of the Corporate team, he has the greatest longevity – about 12 years – but it’s much more than that. In addition to all of the history, the great ups and downs of Help-U-Sell, he has a depth of understanding of what makes us tick and how to turn that into business success. He has a great strategic mind and his attitude is unflagging. After a grueling hour of tool after tool with an Internet marketing ‘guru,’ Ron showed us how to use Instagram to improve our online impact. He showed us, we did it, we had fun, and we got it. If you don’t believe me, check Facebook for yesterday, Nov. 13, and you’ll see a whole passel of pictures of Ron during the presentation, taken and posted via Instagram. Mostly we are blessed to have such a delightful, scrappy team. So many of the people who attended the meeting joined the Franchise in 2005 and 2006 – at the onset of the worst real estate market in history. And they are still here, still strong, still smiling and many have done much more than simply survive. Many have built remarkable businesses as one after another of their traditional competitors have downsized, consolidated and gone out of business. It’s always been great to be Help-U-Sell. It’s once again a great time to be Help-U-Sell. Can you get a listing today? I’m waiting . . . can you? Let me rephrase the question: If you were to be hung by the neck until dead at sunset if you didn’t get a listing today, could you get one? I thought so. Getting a Listing is something you can DO in real estate. You can’t force a sale, you can’t force a closing . . . but you can DO a listing. You can get one. It is always in your power. 6. Work with Tony to build a landing page on your website to capture contact info on people wanting to know what their house is worth. Then create a QR Code for it. Have flyers made with nothing more than the QR Code and the words: ‘See How Much Your Home Is Worth Today.’ Put them all over the place. This is July 5. The longest day of the year was, what? A week and a half ago? So you’ve got a few extra hours of daylight to get it done. Go on now: get out there and don’t come home until you have a signed listing agreement in your sweaty little hand.